Store Front businesses are the heartbeat of the local economy – the shops that line the main streets and side streets of the local community. It’s the convenience store, dry cleaner, fitness center, hardware store, home remodeler, coffee shop, local restaurant and watering hole, the hair salon. 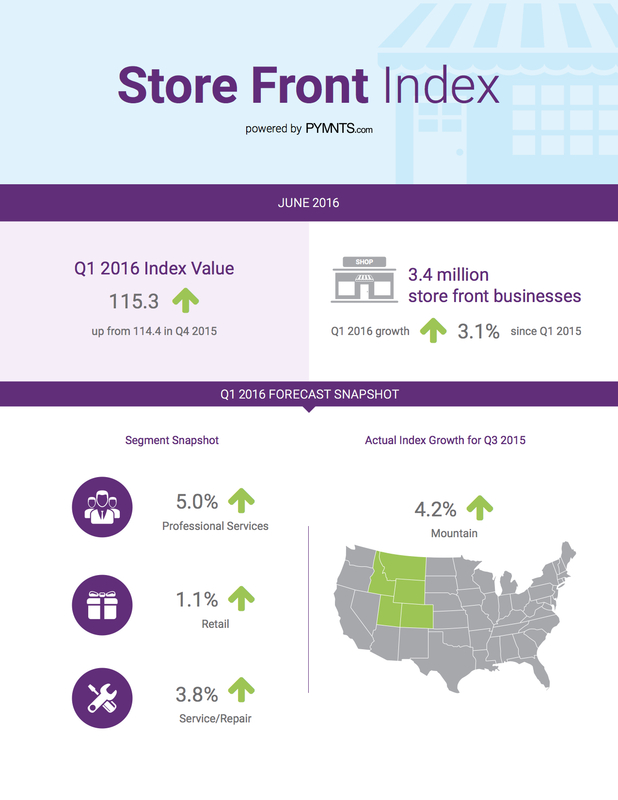 The PYMNTS Store Front Business Index™ has assembled data on each and every one of these businesses across the U.S. and measures their vitality every single quarter. Think of it as your window into the health of this vital sector every 90 days. Professional Services, Building Contracts and Home Remodelers and Fitness companies are the fastest growing industries in this quarter’s tracker, growing at a rate of 5 percent, 4.4 percent and 4.3 percent, respectively. The most growth is seen in the Southwest, Mountain and South regions, each of which has seen growth of at least 4 percent over the most recent four-quarter period. Growth for total wages grew 6.1 percent. This growth is projected to increase by 5.2 percent for Q1 2016. According to analysis in the Index, population growth is positively related to economic development due to an increased ability to produce and consume goods.